Secrets to being the best comedian on stage. Chuck Roy hosts this highly desirable webinar series designed to share the secrets of performing the best set of every comedy show. How to crush your comedy shows. How to write jokes that crush. How to crush at booking gigs. Please, click here to purchase access to the Comedy101 How to Crush a $50 Stand-up Comedy Gig webinars. Professional comedians with a strong desire to take their comedy to the next level. Amateur comedians that want to know how to go pro. New comedians that want to crush their set and get booked for gigs! 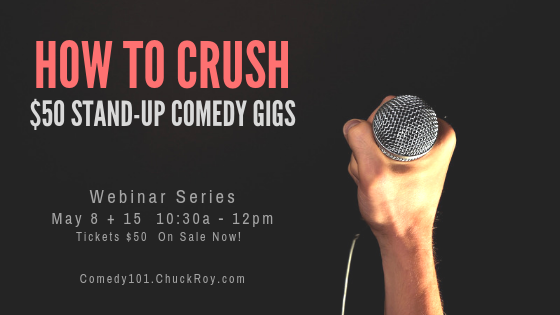 Purchase access to the Comedy101 How to Crush a $50 Stand-up Comedy Gig webinars.